Trade 1 exit was unlucky. The SL hit when I was away from the terminal. I was also away when the Trade 2 entry happened. Was lucky to have been able to exit (SAR), just before the spike up. Then, I lost an opportunity to lock few points in Trade 3. Trades 4 and 5, that happened during the last hour fall, were worse - they resulted from typos. My fingers ☹ slipped on the keyboard or something .... I don't know what happened, I was not focused. I clicked something on my keyboard, and thought that I had gone long at 7755, when in reality it was the exit from a short position that I had created without even realizing it (maybe from another typo...). So, when I thought I was exiting my long at 7746, I was actually creating a new short position. 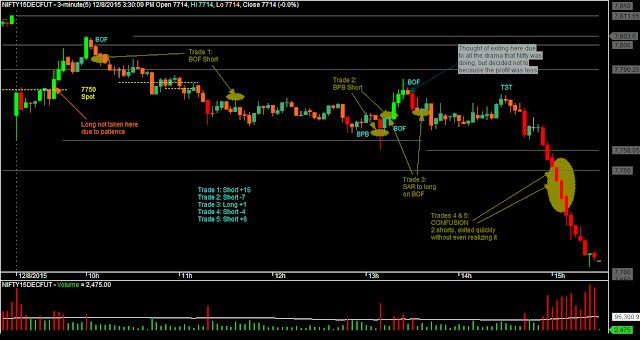 Then, just as I was about to close the terminal, I realized that I was short, and placed a tight SL which got hit. Which means that I had the good luck of being short twice in the fall with small risk (without even realizing it), and the bad luck of exiting those positions for nothing. Confusing? Sure, even I deciphered these trades only after EOD. All of this was updated live on my twitter timeline - available on the right panel of this web page. Since I shifted to discretionary trading this month, I have not had any big losses. So, I will keep playing this system, though the System Hopping itch is creeping in. Which broking firm are you trading with? as number of trades are more compared to points earned. I am trading with RKSV. My cost per trade is around 1.5 points. After deducting that there is not much gained. I checked the Stats since the November series. Until 18th Nov, I did a total of 31 trades at 2.6 trades/day with +7.39 points profit/trade before costs. Since 19th Nov, I have done 61 trades at 4.7 trades/day with +0.25 points profit/trade before costs. Something's not going right, and needs to be fixed. What I feel is that, you must stick to any one method rather than switching between two ( Mechanical and Discretionary ) That is upto you to decide, which one suits you the best.